Guests Love Houston Hotel's Modern AccentsSituated off Beltway 8 and West Road in Houston, this hotel's location is perfectly suited for business travelers who need a hassle-free location. 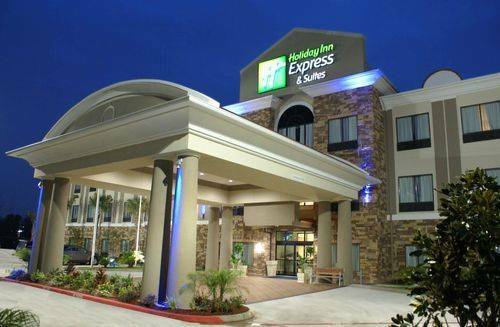 The Holiday Inn Express Hotel & Suites Houston NW - Beltway 8 - West Road greets you with contemporary decor and colorful furnishings that set it apart from other accommodations in the Houston area.The hotel offers professional amenities like a 24-hour Business Center with copy, print and PC services to help you stay on top of projects while you're here. You can email documents to clients with the free Wi-Fi access or meet with them in the hotel's executive boardroom. Guests are only minutes from companies like Siemens, Baker Hughes, Weatherford and NOV.Because the hotel's address is in northwest Houston, guests are only four miles south of the Sam Houston Race Park. Other popular attractions, such as The Galleria and Reliant Stadium, are only a short drive away. Of course, you'll also find golf courses like Heron Lakes Golf Course and tasty local restaurants like On the Rox scattered around the hotel.After a day exploring or working in the Houston area, return to the hotel for a refreshing swim in the outdoor pool or jump on one of the cardio machines in the well-equipped Fitness Center. A free managers reception Mond-Wed from 5:30-7:30pm and a free full hot breakfast awaites you. Call today to enjoy great amenities at a price you can afford. Boardroom comfortably seats 12 people. 50 inch television available with HDMI cable for powerpoint presentations. Over 105 acres' with more than 1,500 different dealers and shops. You can find almost anything here, being the largest outdoor market on the Texas Gulf Coast, where you never know what you will find the next time you go.